When the first story, Cecily G. and the Nine Monkeys was published in France in 1939, George was named Fifi. Around the world, the adventures of Curious George have been translated in many languages, and George takes on names such as "Curioso come George" in Italy, "Peter Pedal" in Denmark, "Nysgjerrige Nils" in Norway, "Nicke Nyfiken" in Sweden, "Utelias Vili" in Finland, "おさるのジョージ" in Japan, "Choni Ha'Sakran" in Israel and "Jorge el Curioso" in Spanish speaking countries. In the United Kingdom, George was originally called "Zozo" in 1941, apparently to avoid using the name of the then King George VI for a monkey. 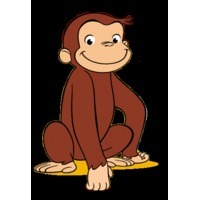 In each of the books, Curious George is identified in the text as a monkey, though in the illustrations he does not correspond exactly to any non-fictional species of monkey (and has more of the characteristics of an ape, especially a chimpanzee, or a gorilla, for example in his lack of a tail - though it should be noted that some species of monkeys, such as the Barbary macaque, have little or no tail).